Really not sure the purpose of this piece is but think maybe for flowers since the back says seed blessing, cant make out the other word. I have shown it in a picture. It is from a local estate sale. 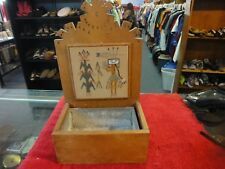 Cool Old Tramp Art Box. 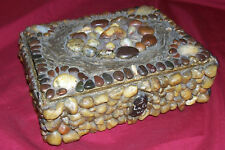 Old cigar box is covered in varnished stones and putty. Box is in good used shape for its age and what it is. Has a stone or two missing on top, two feet are gone off bottom, has mud crack. 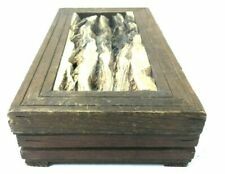 A unique and weird hand made box featuring an inlay of wood knots or live edge. Its wear gives the piece an overall rustic feel. There is wood missing on one foot, but the nails are still in place and keep the box level and functional. The item you will receive will be similar to the one pictured. ONE SMALL SHELL IS MISSING FROM SIDE AS SEEN IN PHOTO #2. Size 6” x 8”. The picture is very good condition. Also showing many pictures for you to see. Don't let it get away! Vintage Blk Lacquer Egg Shape Box Vietnam Lable.folk art good Condition. This piece has a label Vietnam on bottom. birds in flight.This truly is a nice piece of oriental decor. lacquer is good all outside. Made out of wood and ceramic. 3 3/8" closed.